6 Open Standards “Open” ve “Open standards” ne demek? Kodlara erişim Kuruma göre uyarlama Kullanıcıların haklarına öncelik Geliştirme Metodolojisi Yazılım Geliştirmede ortak Hareket Kişisel Gelişim Kullanıcı, Geliştirici ve Sponsorlardan oluşan bir topluluk Katılım herkese açık Open Source is three main things – a way of developing software, a licensing approach which prioritises the rights of users, and a community with open participation. The first component of Open Source is the approach to licensing the software. Open Source is not freeware, shareware or unlicensed – it’s just licensed in a different way to traditional commercial software. 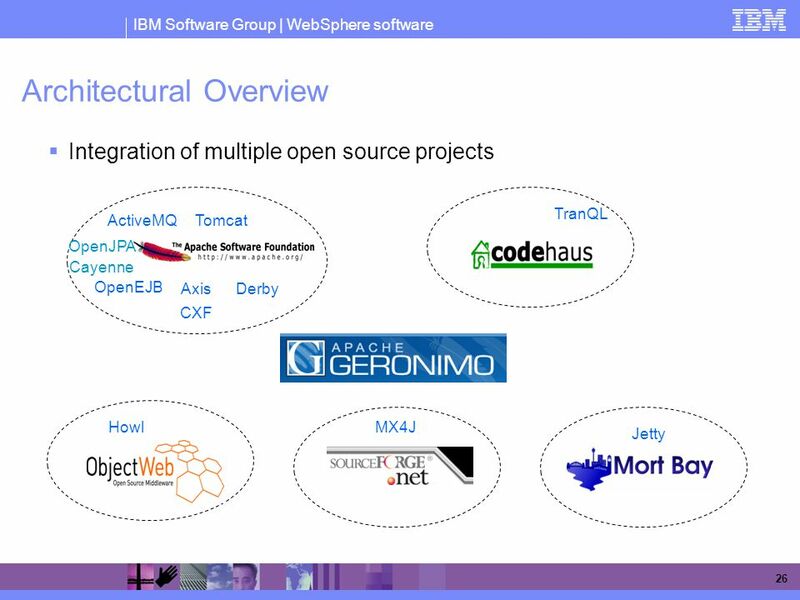 In formal terms, Open Source means that the license is one of about 60 licenses authorised by OSI - the Open Source Initiative (their logo is shown on the slide). Although there are many licenses, only a few, such as the GPL license used for Linux and the Apache license, are in broad use. The next component of Open Source is a development methodology which uses a community approach to developing software, based around peer review. Since the code is openly published, everyone can see whether it is good or bad code – and offer feedback on how to improve it. This then promotes a meritocracy of developers – you get to be a key player by writing good code. Finally, Open Source is all about open community – not just for developers, but for users and partners as well. Projects such as Linux, Apache and Eclipse offer a level playing field where anyone can participate, based on merit. 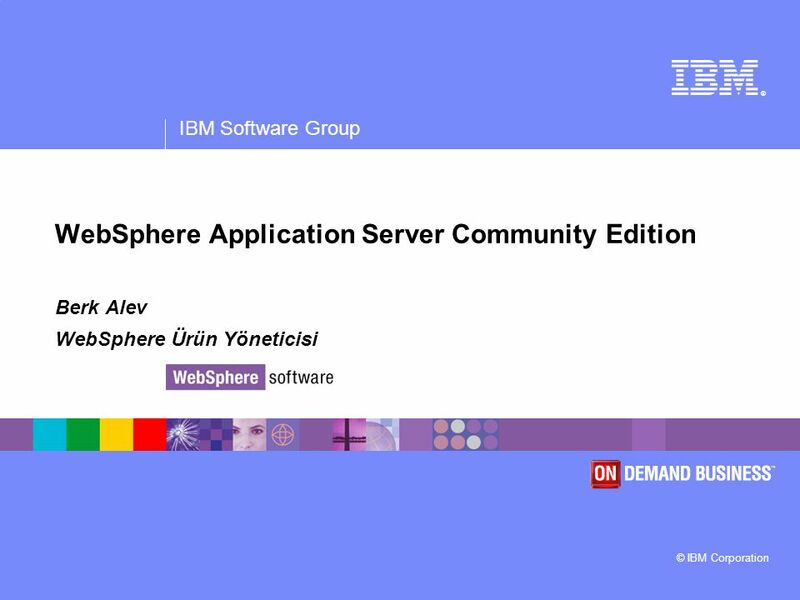 These open communities are very different from vendor controlled communities like MySQL and JBoss where true open participation is prohibited. 10 Open Source Neden Önemli? 11 Open Source nereye gidiyor? 12 Neden Kurumlar Open Source kullanır? 13 Hangi alanlarlarda Open Source? Neden kaynak koda erişmek isteriz? Developer’lar ürünü incelemeyi severler (read-only) İhtiyaçlara göre kodu geliştirebilir. Kritik durumlarda hızlı bir “fix” yazılabilir Kodu değiştirebilir (çok az görülen ve maliyetli bir durum) Soru: Open Source bir yazılım yukardaki ihtiyaçları her zaman karşılar mı? Her zaman hızlı mı? Üstüne vakit harcamaya değer mi? Open source projeler çok popüler… ama bazen bu popülerlik yok olabilir Hızlı “fix”ler çok tehlikeli olabilir – ve öngörülmeyen sorunlar çıkarabilir Kodu değiştirmek çok maliyetli Masum amaçlı (read-only) müdaheleler dışında, bir çok kurum kaynak koduna müdahale etmiyor. Stratejik avantajlar sağlar ise durum farklı. 15 Kurumlar Open Source ve Marka ürünler arasında yeni bir denge arıyor. 17 Open Source bir tehlike değil… bir AVANTAJ! 25 What is Apache Geronimo? 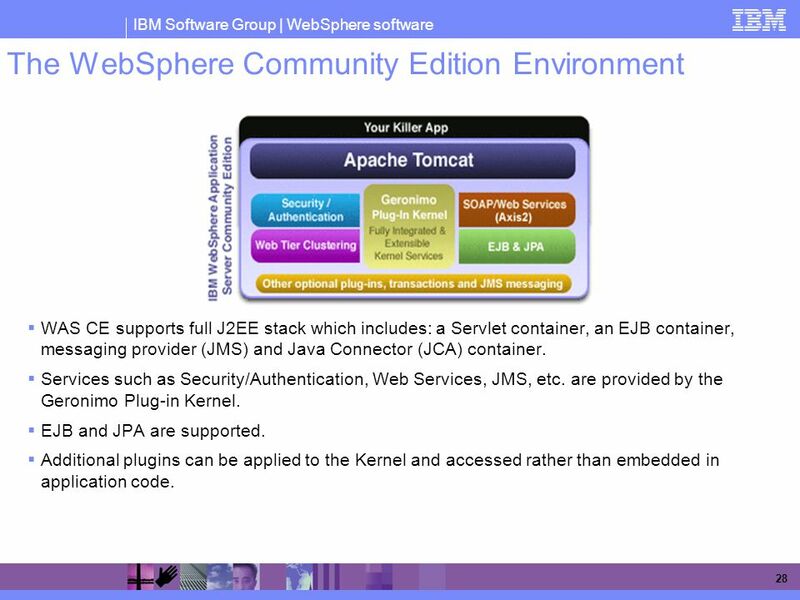 WAS CE supports full J2EE stack which includes: a Servlet container, an EJB container, messaging provider (JMS) and Java Connector (JCA) container. Services such as Security/Authentication, Web Services, JMS, etc. are provided by the Geronimo Plug-in Kernel. EJB and JPA are supported. Additional plugins can be applied to the Kernel and accessed rather than embedded in application code. 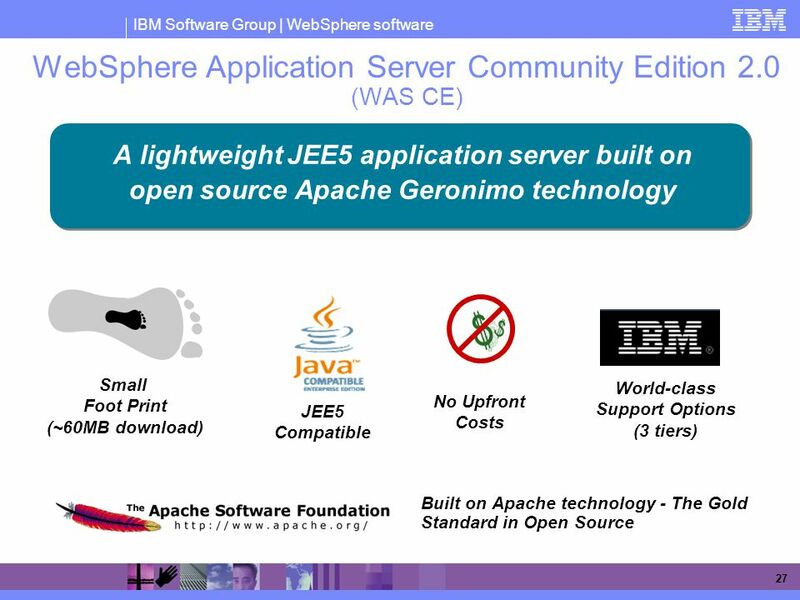 Let me explain some of the key features of WASCE 2.0 Leverages Apache Geronimo 2.0 WAS CE offers the innovations in Apache Geronimo, including overall server hardening, ___, and the Geronimo plug-in architecture. 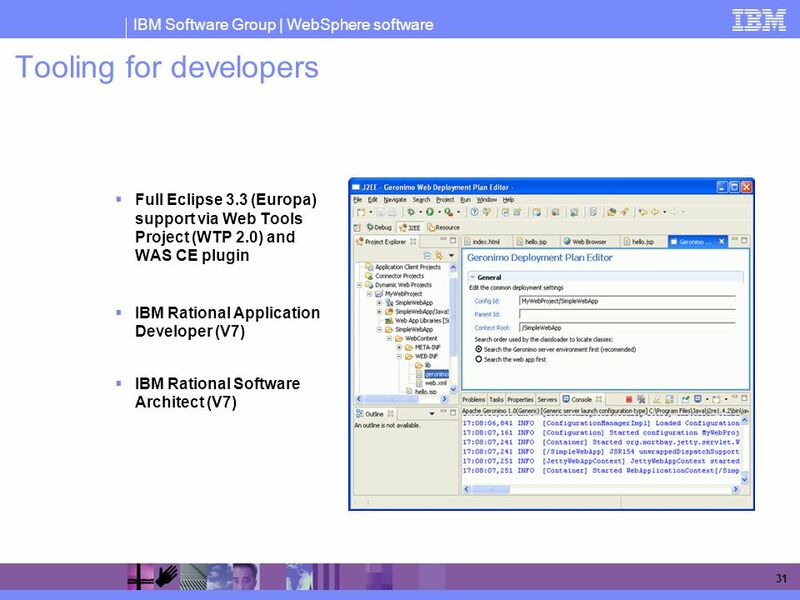 As discussed on the previous slide, the plug-in architecture allows developers to create plugins to extend the functionality of the application server; numerous plugins already exist, and the open source community is creating more plugins to integrate new technologies into Geronimo and WAS CE. 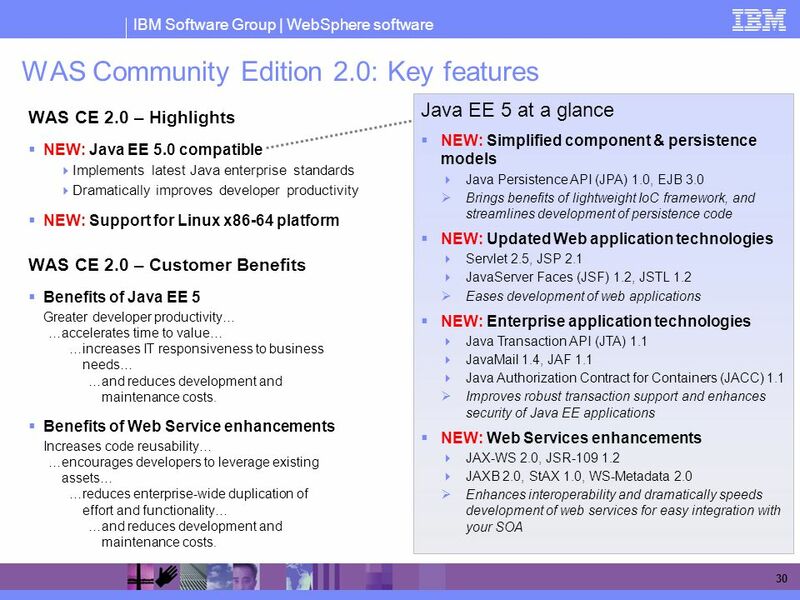 Java EE 5.0 compatible [omitted – discussed in detail on next slide] Database support WAS CE includes the IBM Cloudscape embedded database for development and production use; customers who buy WAS CE support automatically get support for Cloudscape as well. WAS CE also supports the use of free databases such as IBM DB2 Express-C and MySQL, as well as the most popular commercial databases such as IBM DB2, MS SQL Server, and Oracle. Eclipse plug-in with Europa support WAS CE offers an Eclipse plug-in that now supports the Eclipse Europa release. Europa is the 3.3 packaged release combining several Eclipse projects. Centralized configuration and control WAS CE includes an easy-to-use console for managing the application server, including deploying and undeploying applications, configuring system services, and tuning the application server’s performance. 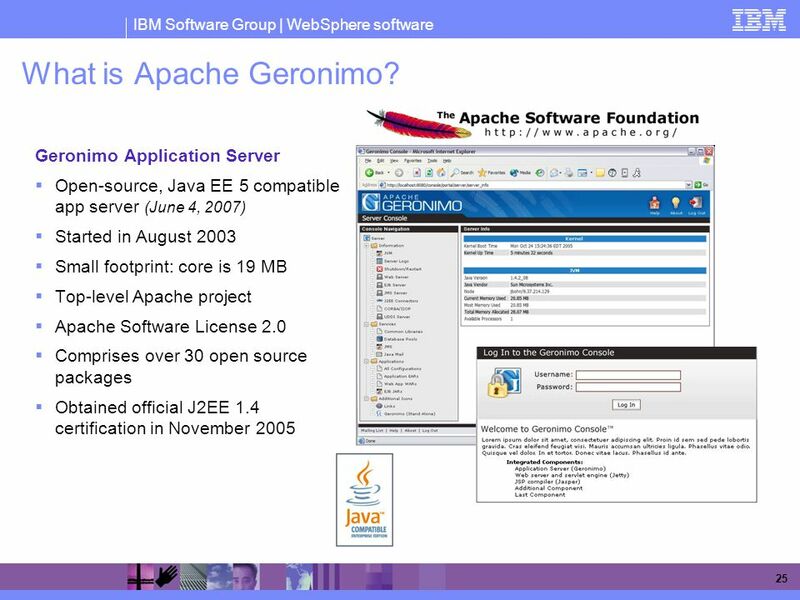 The Geronimo architecture is built from the ground up to support customization of the application server at runtime. This means that you can easily tune WAS CE via the console, and your changes take effect immediately—giving you immediate control of the server and reducing the need for downtime resulting from configuration changes. Platform support WAS CE supports many popular platforms as shown. Check the detailed WASCE website for the latest updates and other info at >‘System Requirements’ > ‘Detailed System Requirements Small Footprint It’s easy to get started with WAS CE—the download is only around 60MB, so developers can easily download it, install, and get going, usually in less than 10 minutes. 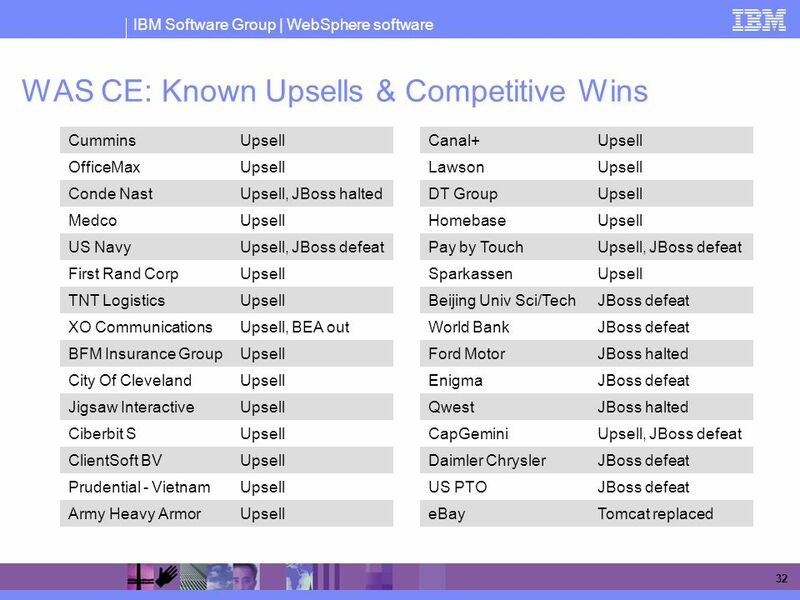 WAS CE’s small size also means it’s easy to embed in a larger stack, which helps both customers and ISVs build a total solution using WAS CE. 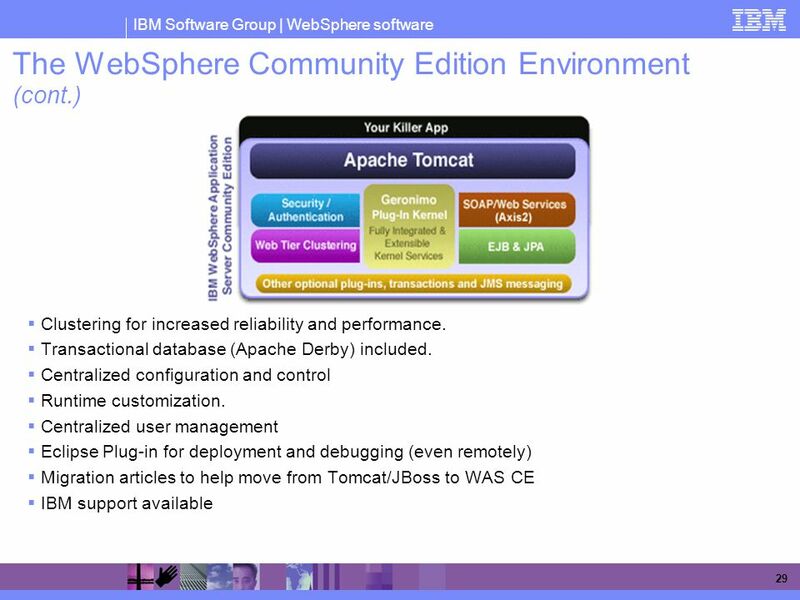 Improved reliability for most commonly deployed applications WAS CE supports the clustering features of Apache Tomcat as its servlet container to provide failover for web applications, increasing your application’s availability to users. WAS CE is compatible with load balancers such as Apache’s 2.0 mod_jk and Apache 2.2 mod_proxy_ajp More flexible and rapid deployment across multiple configurations WASCE supports 5 different ways to deploy your application. Deploy from the console, from an IDE like Eclipse, use the deploy tool, hot deploy using the deploy folder where the developer can deploy by inserting a WAR or EAR file, and finally, in place deployment from tools like Maven. Liberal product license The WAS CE license enables customers and partners to use WAS CE in whatever way meets their needs, without any obligation to pay for a license. 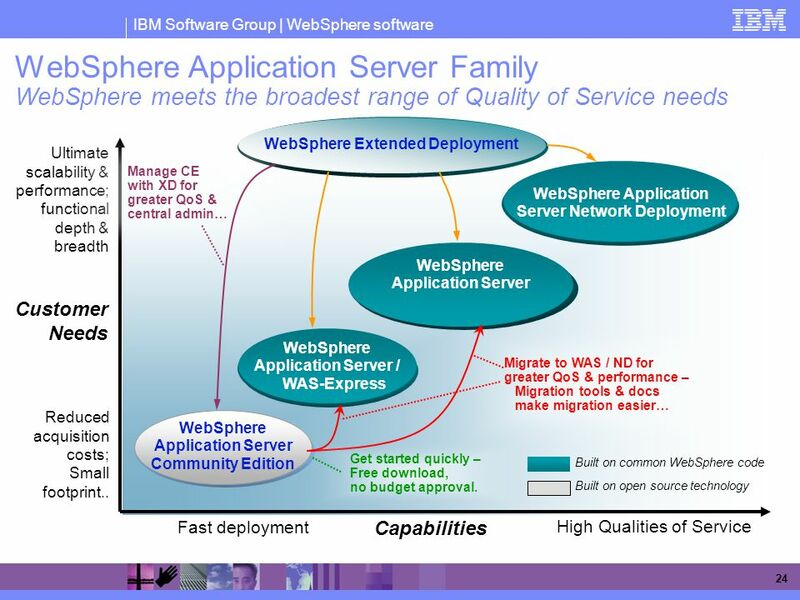 Portability to other servers in the WebSphere Application Server family The Eclipse plug-in’s J2EE profiling tool helps ensure that applications are fully J2EE-compatible, which in turn simpifies the task of migrating applications from WAS CE to WAS. Migration documents WAS CE’s documentation includes migration guides that assist in the effort to migrate applications to WAS CE, as well as in migrating applications from WAS CE to WAS. A JBoss migration tool is availabel Translated documentation Documentation for WAS CE is available in the eight languages shown in addition to English. University of Pennsylvania English Language Programs 2013-2014 English Language Programs.